Life Is What Happens: Best of the Show! I think that I may have finally recovered from TNNA, as the orders we took there are now being shipped, our show booth has arrived home and the follow up orders, from stores who met us but needed to think about ordering, have started to flow. Also, I have to report that in the midst of all of this exhaustion, my 91 year old father decided to do some welding in the barn, dropped the blow torch while still lit, set a small grass fire which he couldn't put out, fell into the fire and sustained second and third degree burns. A passing motorist saw him and stopped. He was airlifted to a hospital with a burn unit on the eve of Father's Day and we feared the worst. Well, after 5 days, he has had an operation to graph skin to the damaged area, has been moved out of intensive care, is off morphine, ventilators, monitors you name it and is back playing the lottery!! I have given thanks more than once - believe me! So in celebration, I am posting Dorothy Siemens description of the design process for her Peacock Feathers Shawl (as promised). This pattern, indeed, was the "Best of the Show" - with the Paisley long shawl coming a close second! To me the shawl is an example of pure joy. There is something in the flow of the lace, the curve of the stitches and the gentle development of the pattern that reminds me of smiles, happiness, laughter. It is light, airy and obviously a joy to knit! - though designing it was certainly a challenge - read on! The Peacock Feathers Shawl seems to strike a responsive chord in many knitters. I originally came up with the concept for this design while admiring a peacock's tail feather I had pinned to my studio bulletin board. The usual approach would be to try to capture the wonderful colours, but since my medium is lace, I wanted to interpret the graceful shape and flow of the feather and especially the lovely, large "eye" that makes it so distinctive. I envisioned the tail in partial display sweeping out behind the peacock, and in my mind's eye could see it as a lace shawl sweeping down from the shoulders. But I find that my design ideas are often fraught with difficulty once I try to translate them into an actual product. The Peacock Feathers Shawl was no exception! The first thing I do when embarking on a new design is look through my stitch dictionaries and reference books. If I can find an existing lace pattern to incorporate into my design, so much the better. In this case, I was looking for something that would give the appearance of feathers. I wanted the shawl to start out with a small, feather-like pattern at the top neck, just as a peacock's feathers are smaller on the neck and back. Then I envisioned the feathers gradually becoming larger and opening up into the flare of larger feathers cascading away from the peacock. I was successful in finding a suitable pattern for the small feathers-actually a small leaf motif from one of the Barbara Walker Treasuries, but the other feathers were not as easy. The secondary feathers with their eyes did not exist, and so I had to design my own. I found a lace pattern in Barbara Walker's blue A Treasury of Knitting Patterns on page 214, which had the basic structure I was interested in. But it took a fair amount of recharting and swatching to figure out how to make the "eye" work nicely. I struggled with it, but learned a lot as I went on. Working down the shawl, the feathers become larger and now have long stalks, and again, I had to design these elements basically from scratch, but using the previous "eyed" feathers as a basis. Somewhere in the midst of this, I was overcome with frustration and wondered if I would ever be able to capture the image I had in my head. I find that I usually go through this angst in the middle of the design process. Once I reached the edging, I wanted the lace to flow seamlessly into the really large, showy feathers at the bottom of the peacock's tail. I set myself some parameters. The edging should not be picked up and knit separately but should be knit all in one piece with the shawl. It should also be wavy and graceful and provide a really beautiful finish for the shawl. 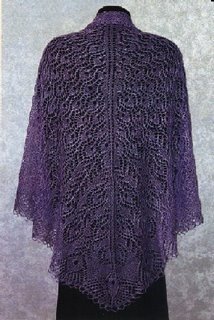 I was influenced by two books in my library, The First Book of Modern Lace Knitting by Marianne Kinzel, and Three-Cornered and Long Shawls by Sigridur Halldórsdóttir. The latter book has some of the most gorgeous shawls I have ever seen, and I particularly like the way edgings are handled on many of them. The delicate crocheted edge on some of the shawls seemed perfect for my concept of feathery ends and I incorporated this into my shawl. I also learned from both books a lot about how to structure a wavy lace edging, by swatching pieces of their designs to help me understand what they had done. Once I had all the charts worked out, I began to knit a sample and found, of course, many things that needed tweaking and changing. Somehow, a motif that seems to look good and work well in isolation often needs to be adjusted when knit in a group. I am no stranger to ripping out, over and over again. This shawl continues to be a favourite among knitters and is my best-selling design. I even received an e-mail from someone who saw a finished version and although had never knit before, was determined to learn so that someday she could also knit the Peacock Feathers Shawl. As you can imagine, I find that completely touching and gratifying, and am very happy that my design has been able to reach out to so many.